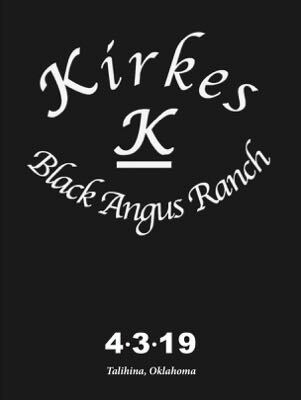 Kirkes Black Angus Ranch is located in the rugged mountainous region of southeast Oklahoma. This area is a climate of extremes from being a Federal Drought Disaster area in the fall of 2017 and again during the summer of 2018 to one of the wettest fall and winter periods in recent memory beginning in September of 2018 to current. We experience extreme heat advisories during the summer with the excessive humidity and almost always get much colder air than is forecasted. Cattle leaving the ranch are ready for whatever Mother Nature has in store for your region. K BAR is committed to not only putting more pounds on the scale, but putting more valuable pounds on the scale for the life of our industry. The better the beef placed on the plate the more the demand will rise for that beef. K BAR has remained one of the most disciplined breeding herds in the country over the years and has produced some of the breeds very best in across the board balanced performance epd’s profiles. A few have been recognized as some of the breeds leaders like K BAR Progress 2972, # 2 in the breed for marbling, K BAR Predestined 167 # 2 in the breed for marbling among the most proven dams. K BAR Sunrise 1402 a top 100 in the breed for Rib eye and $ Beef, GAR Rampage H26 a top 100 for Rib eye and $ Beef. The K BAR bulls and females to sell April 3 will also represent some of the best the Genetics the Angus Breed has to offer. There will be herd sires for registered and commercial herds and many females that will produce future herd sires. A great number of the females will carry the service of K BAR Boomer one of the breed’s most exciting young sires with 10 performance traits ranking in the top 1% of the breed. Please join use on Wednesday April 3, 2019 for our first Spring Production Sale. Some of the breeds best complete performance cattle will be offered to you for your consideration. Videos of the cattle will be available on liveauctions.tv in the days preceding the sale. Take a look at those bulls they are looking very good.